I invented these cookies for my town’s recent Illumination Party. Just be sure to use homemade or high-quality eggnog when you make them! Start with the cookies. Cream together the butter, 3/4 cup sugar, and vanilla. Add the egg and eggnog, and beat until light and fluffy. Blend the dry ingredients and stir them into the creamed mixture. Wrap the dough in wax paper, and chill it for at least an hour. Preheat the oven to 375 degrees. 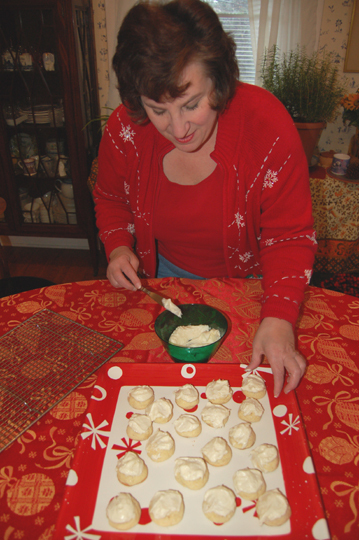 Roll small balls of the chilled dough in sugar, and place them on greased (or parchment-covered) cookie sheets. Bake the cookies for 8 to 10 minutes, until the bottoms brown lightly. Let them cool for a minute or two on the sheets; then remove them to a wire rack to finish cooling. Next, make the icing. Beat together the butter and eggnog. Beat in confectioner’s sugar until you have a smooth but not wet icing. Add the vanilla, and spread the icing on the cookies. If you like, throw on some sprinkles for color. 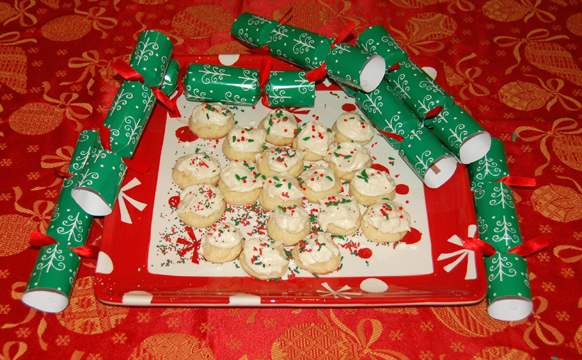 This entry was posted on Friday, December 19th, 2008 at 4:26 pm	and is filed under Cookies and Bars, Holiday Foods. You can follow any responses to this entry through the RSS 2.0 feed. You can leave a response, or trackback from your own site. Yum! I never thought of eggnog cookies!